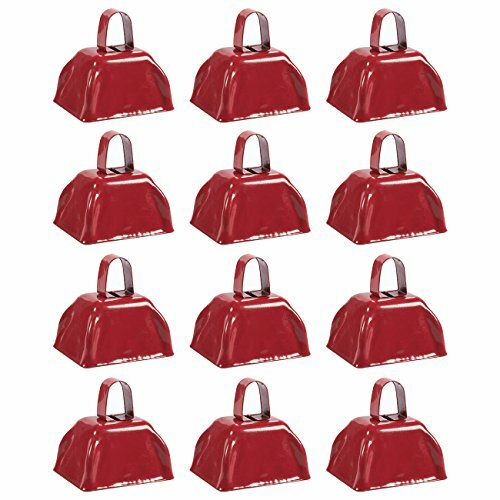 Make some noise and cheer on your favorite team with this set of 12 of quality, 3-inch Cowbells with small handles. Each bell's smooth exterior surface finish makes it ideal and easy to decorate and customize with adhesive stickers, decals, paint or permanent markers, so you can show off your team spirit or just personalize each one. All bells feature a clapper ball on the inside, so there's no need for a drumstick! FEVER FOR MORE COWBELL: This set of 12 handheld, 3-inch cowbells are designed for cheering at sporting events, for using at public markets, weddings, classrooms, or for use in agriculture. Each cowbell comes in red. RELIABLE MATERIALS: Each bell is made of sturdy iron, and features a small handle at the top of each bell, for portability and convenient usage when outdoors. THE ONLY CURE IS MORE COWBELL: Cheer for your favorite team the loudest, help spread your public message more clearly, help with sales at a market, or make sure your kids know to come home from playing outside, all thanks to the clarity and sonic volume that the cowbell can produce when rattled hard enough! HELP PEOPLE IN NEED: These cowbells can come in handy in emergency situations where a cellphone might not be available, for example, when dealing with a seriously injured neighbor or friend in a rural area.